My most current bee hive top color choices of mariposa lily orange and forest green (the husband says it’s British Racing Green) came from long, diligent thought (kind of). The green was in the hayloft, left over painting trim on my house. The orange was was last year’s color, and I had a bit left. That paint ran out before I was done with the tops and the Stockton’s Paints, my favorite paint store is an hours drive away (one way). This entry was posted in 1 Beekeeping, 6 Honeybees -interesting stuff and tagged 1 Beekeeping, 8 Brookfield Farm & Bees, bees, Brookfield, Brookfield Farm, color vision, colors, do, hives, Karen Bean, Maple Falls, painting, see, Washington, what. Bookmark the permalink. What a great post indeed. 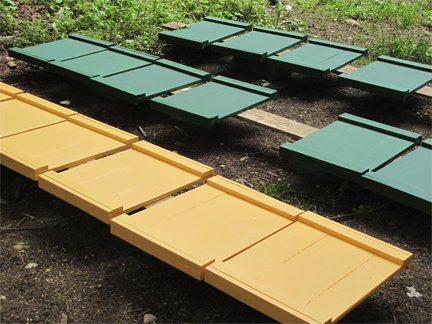 We tend to paint our hives, light colours and use whatever we have left over. The hives we make are natural wood painted with linseed oil. We wonder if the bees can see the different grain patterns on their hives? Our last painted batch were all military grey, which was a mixture of a few paint tins we found under a house. I love your coloured hives, we must look at getting more colour in our apiary. Hi Gary – Thank you (you’ve probably guessed I’ve not been back to wifi land – the library – in a while). Your use of linseed oil fascinates me. How much rain do you get? I’m always looking for a paintless exterior hive treatment that withstand rain (we get about 46 inches a year). Just this past weekend we were told that the linseed oil and beeswax mixture commonly used really needs annual application. I had that horrible feeling – the annual reapplication. Oh well, there’s never an end to the work, is there? Keeps us young. Hello from a sister Bee-Keeper company, though solitary vs. social. If you were to speculate on what equipment would be necessary to create artificial sun that would be “natural” indoors, what would it be? polarized light… but with what equipment. Wow, that one is beyond me. I would guess a full spectrum light (florescent or led) – the “day light” florescents are not full spectrum, they just go off at 5600K…(if I remember from my previous life as a gaffer). What color do they see as gray? I’ll check this out later again. Don’t notify, your book marked, lol. I don’t know, but I would think any light red would read as gray – kind of like we see black with a lot of white in it as grey. It’s just a guess. Anyone else know? Can you use any knd of outdoor paint to paint hives? The bee catalog we have (live in Italy) has a special paint that is very expensive. I wondered if you need to use a special paint as it seems a lot of people use leftover paint. I use good quality water-based exterior house paint. Primer, then two coats of paint. Nothing special – but good paint because I hate to paint hives and primer & 2 coats lasts. There are interior house paints that are supposed to have less fumes (or something), but as only the outside of the hives are painted, I don’t worry. I am testing a water-based, “eco-friendly” stain this year…as I said I hate painting…http://www.kelleybees.com/Shop/13/Hives-Components/Accessories/4192/Eco-Wood-Treatment I sure hope this works – it rains a lot here. Eco-friendly, cheap to ship (it’s a powder, you just add water), and “once in a life time treatment” – heck, I’d just be happy with the first two, the third would be magic. Hi~I enjoyed your post on bee vision. Reading further about painting hives, I have concern about paint fumes. Are there better seasons or times of the day to paint that would minimize exposure to paint fumes? Better to use exterior vs interior–as far as fumes? Would love to hear from your or any of your readers about your/their experiences—especially “don’ts”. Thank you. Paint fumes for you: do it outside. always use exterior paint. I do a primer and 2 coats (just like a house) Which is always a problem for me here in the Pacific Northwest (it’s only dry outside in the middle of bee season, when there’s not time to paint.) I’ve tried painting in the hayloft on damp days – the paint does not stay on well. I’m going to try “Eco Wood Treatment” non-toxic stain ecowoodtreatment.com — and do it inside, in a well ventilated room, in the winter. Fumes for bees: as one only paints the outside, and nothing inside the hive, I figure the bees are ok, once the paint’s dried. After all, bees move into house walls with no problems (except to home owners). There is dipping in parafin or beeswax (fire hazards scare me during storage). And was it linseed oil? Perhaps another reader could lead the way on these options. Thank you. My main concern is about painting a hive is fumes that might affect the bees already in it. It would most likely be painted outdoors. I’ve had another question about painting a hive a different color from its original, when the bees first took up residency. I only want to change the color because the deep super is a neon orange (not my choice of colors anyway, but the box was given to me). If I understand you correctly, they would possibly perceive this color as grey or black. If I painted the box a more neutral color, would this confuse the bees? I imagine they would still gravitate to their queen, but would I cause them stress by painting the box a different color? Thanks for your insights. You know, I’ve never contemplated painting a hive with bees in it. I would be more concerned about the bees getting paint on them. But the fumes might make the bees not want to enter their hive. If you can change the bees/frames/brood…to another box, and then repaint the painted box, it would be better I think. Plus one coat of paint over a neon orange would probably just go muddy (my husband painted houses in a former life) Actually neon Orange is just fine for the bees – they apparently see orange (possibly like a dark yellow if I remember my color wheel correctly : red and yellow make orange). It’s red they see as black. I’d live with the color, but then I like neon orange. I would love to read an update on the ecowoodtreatment you were going to use on hive (Sept 2014) Thank you! I really like the stuff – mind you those have only done one mild winter here. I’m going to stick with it — although I’ll miss my pretty colors. It seems to protect the wood as well as the paint, and seems to have no effect on the bees (stains on the outside, not the inside, of course). Plus I can do the staining in the winter, in the basement. My one warning: I put it in a brand new paint can that was made for water based paints. Seemed a good idea at the time – bad idea. The water was too much for the can, it leaked, and I now have a lovely stain on my concrete floor (a very pretty color, but not quite the thing I want). I’ll do the next batch in a plastic bucket — oh where would a beekeeper find one of those, eh? Human primary colors are not red, blue and green. They are red, blue and yellow. Actually, the Blue-Red-Yellow Newtonian prism model predates modern science. We still use it to mix paint, so most artists refer to it. But, when discussing light, the additive color primaries of red, green, and blue, which correspond to the color receptor rods in our eyes, are correct. (Additive: when you mix all three colors together you get pure white and the absence of all three colors of light results in true black.) This would be the appropriate context to compare human and bee vision. The intersections of each of two additive color primaries produces magenta, yellow, and cyan, respectively, which are the three subtractive color primaries we now use for pigment. (Subtractive: When you mix them all together you get near black, and the absence of them results in white.) These color primaries correspond to the wavelengths of the visible spectrum that the pigment absorbs and reflects. Think about graphics you might create on your computer. When creating something to be seen with light, such as a website or film, we use the RGB model. When producing things to be seen in print, it is best to use the CMYK model (with K representing true black). That’s brilliant. Thank you. So we were not totally nuts in the film industry (yes we were, but not about RGB). One of the great things about doing this blog is that I get to learn so much from other people. Great post! Why do bees see red as black? I don’t really know, but I think it’s because red falls into the colors they can’t distinguish (like we see ultraviolet as “white light”, I think, but the bees can see the colors in the ultraviolet). Just my guess. My hubby, so he had a change, the first time he wore it he was stung throught it. Hed never been stung before, anyone got any ideas? It’s said that bees don’t like dark colors, but that could just be an old beekeeper’s tale. Interesting that he got stung though the suit (the little darlings sometimes crawl inside with me — hole? what hole?). It could have just been an aggressive hive defender. 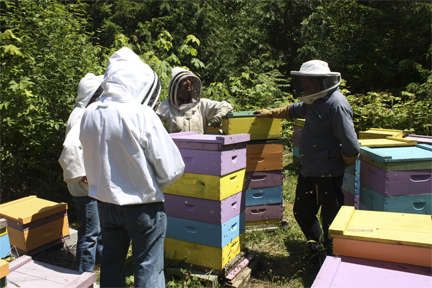 Read somewhere that beekeeper’s should not wear blue clothing in the bee yard. Evidently it makes the bees very aggressive. I haven'[t taken any chances, I am not wearing blue just to find out after reading the post by Teri. Hi again – not wearing blue is a new one on me. There’s a place in the UK that sells blue bee suits. But they would see blue. Of course they see white too. Do they see white and dark mud stains – yes they do, it’s the color of my bee suit – it’s wet here. I’ve been told not to wear black, they don’t like that. In my experience, they don’t give a toss about the color you are wearing. It could actually be helpful when releasing queens to have a blue (or yellow) suit: queen flies, you stand still, she just might focus on the large blue (or yellow) blob and come back to the hive. My experience is that if they want to sting, they’ll come for your face: they smell your breath, I think. After all, if you’ve only got a small sting, and the thing attacking you has a thick coat and fat (think bear) the one place you can make an impact is on the nose… Just smoke lightly, go gently, makes for calmer bees, but you knew that. Forgot to ask a question. So what colors should we be painting our hives so the bees can easily find them? I was planning on using the queen marking colors so I would know how old my hives and components are. Think that would work? What do you think if I use lavender color and lemon yellow for my hives? I think it would be lovely. And very visible for the bees as well. 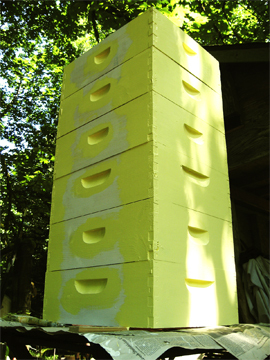 Hi, I just started painting my bee hives this year and mixed the paint myself from leftovers. I used lavender for the brood boxes and honey yellow for the supers. Some are baby blue that I got from my neighbor also plain drab white. Our area gets so hot in summer that the top boards needs to stay a lighter color or the bees just bake inside. I may make every hive a different color next year if the bees can distinguish their hive from another another according to it’s color. I love the wide variety of colors you have in your bee yard.Thanks for the article,it was so interesting. Sorry for the delay – hip surgery set me back in everything…I think your hives sound lovely, and it does help the bees find their own hive. Thank you – walking with out a cane now…so things are progressing.